Today was the final day of Once Upon a Reader trunk shows in SELCO. 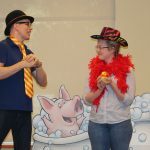 Author/illustrator Derek Anderson traveled the region, reading, singing and playing with children in an energetic show based around his book, Ten Pigs: An Epic Bath Adventure. 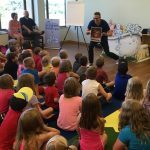 Library staff throughout the region did a great job promoting the shows and, after six days and 12 trunk shows in 11 communities, Derek said he thoroughly enjoyed his time in southeastern Minnesota. Hundreds of children, caregivers and parents who participated in the high-energy trunk shows agreed. Aimed at pre-K children and their families, this statewide one-book program promotes Minnesota children’s literature and encourages families to Talk, Sing, Read, Write and Play together – five practices critical to early literacy skills development. Additional resources for libraries and parents are free and downloadable at www.onceuponareader.org . A CRPLSA sponsored Library Legacy activity with funds from the Minnesota Arts and Cultural Heritage Fund. 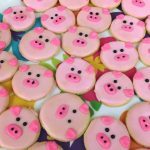 This entry was posted in Legacy and tagged ACHF, early literacy, Once Upon a Reader, one book, OUR, SELCO, Ten Pigs. Bookmark the permalink.